Since learning a more complete history of Jefferson in recent years, I find I have to set aside that information to focus on the limited scope of this book. The is no denying the impressive contribute he made to our country in politics and in concrete terms when he regenerated our Library of Congress after it was destroyed by fire. The writing, citations of actual quotations from family members, and informative illustrations make this an appealing and important book for many ages. “I cannot live without books” quoted by Mr. Jefferson in 1815. This picture book explains his life’s dedication to books and libraries. When visiting Europe, he purchased two thousand books in five years! His library became the foundation for the Library of Congress. The pen/ink drawings are supplemented with watercolors, which is very appealing. This book is for all ages! Thomas Jefferson had his faults but this book focuses on his love for reading and collecting of books. I learned a lot about Jefferson’s contribution to the Library of Congress’ collection (basically starting/rebuilding it). 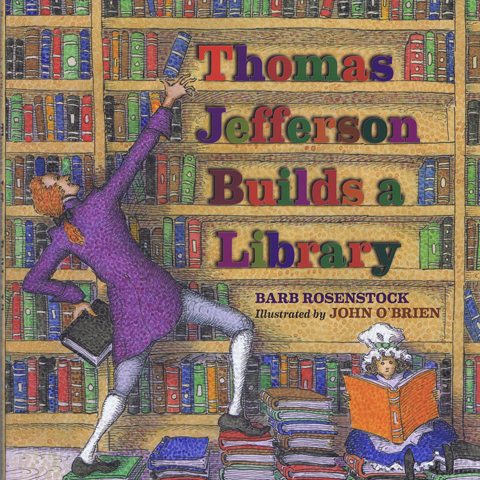 A busy little biography of Thomas Jefferson’s love of books and libraries. Informative and energetic. But wondering about the illustration of Monticello, which lacks the signature octagonal room. Really nice Children’s Picture Book. I learned thinks about Thomas JEfferson I didn’t know and I admire him much more.Lovely story. How can a passionate bibliophile like me not love a book about another passionate bibliophile like Thomas Jefferson?